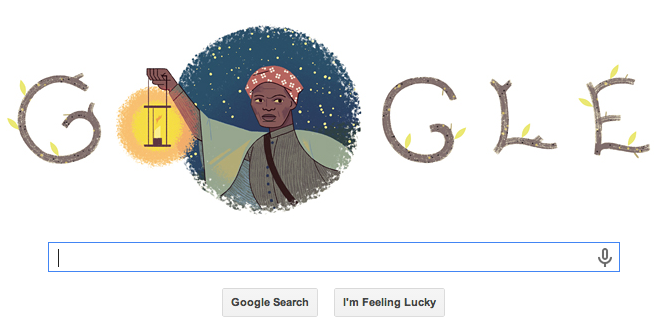 Today’s Google Doodle depicts American abolitionist and Underground Railroad conductor Harriet Tubman (c.1820-1913) in honor of the first day of Black History Month. Born a slave in Maryland, Tubman worked as a maid, nurse, and cook before she left her family and fled to Philadelphia in 1849. In Dec. 1850, she returned to Maryland to help her sister and two children escape to freedom. For the next decade, she became the best-known conductor of the Underground Railroad, a secret network that helped fugitive slaves in the South reach safety in Northern free states or in Canada. The abolitionist heroine went on to serve as a spy for the Union Army during the Civil War. She would pretend to be an old, frail woman and wander around towns under Confederate control to get clues about the whereabouts of troops and supplies. In the last part of her career, she campaigned for women’s suffrage. In March 2013, President Barack Obama signed a proclamation to establish the Harriet Tubman Underground Railroad National Monument, and a state park is expected to open in Maryland in 2015. Next Next post: Eva Marcille And Kevin McCall Welcome Their New Born!